Although we are a very modern office, Dockside Dental does NOT stray away from Good Old Fashion honesty and sincerity. Dockside Dental takes great pride in maintaining the highest standards of ethics and trust. Dr. Sam truly believes that successful Dentistry is based on a trusting relationship between Doctor and Patient. At Dockside Dental, we will continuously strive to earn and maintain, year after year, your trust in us. Dr. Sam and his staff value their special relationships with each individual patient and families. Dockside Dental continuously implements the latest Dental technologies with respect to Dentistry and Sterilization. Dockside Dental is very aware and sensitive to all patients concerns regarding sterilization and safety. Thus, we have an office that you can feel safe and comfortable for all your friends and family. be achieved if there is a different Dentist treating you at each visit. Dockside Dental does not present a Clinic atmosphere. 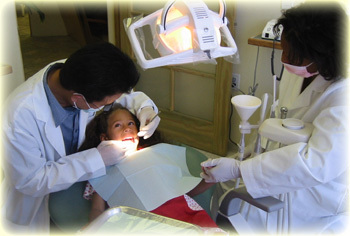 All patients are treated as individuals with their own unique Dental needs. Dr. Sam is very sensitive and understanding with fearful and phobic patients. He says, I am still a little fearful whenever I switch roles and have Dental work done. So I understand the patients concerns and fears and will do whatever I can to make it a pleasant experience. And Dr. Sam used to only see children and highly stressed adults, so he is prepared to meet all your family needs. Dockside Dental offers a vast range of Dental Services. We are very experienced with Cosmetic Dentistry Procedures such as Teeth Whitening, Porcelain Veneers, Dental Bonding (Tooth colored fillings). We also provide Traditional General services like Root Canals, Extractions, Fillings, Crowns and Bridges. We also are experienced with Full Mouth Reconstruction and restoring Dental Implants. Dockside Dental also practices the leading techniques in Sports Dentistry. We have made several Custom Athletic Mouthguards for Professional Athletes.